← USA: HIGHLY TOXIC CANNABIS IN MASS? USA: Overdose Deaths – What Drugs are Killing People? 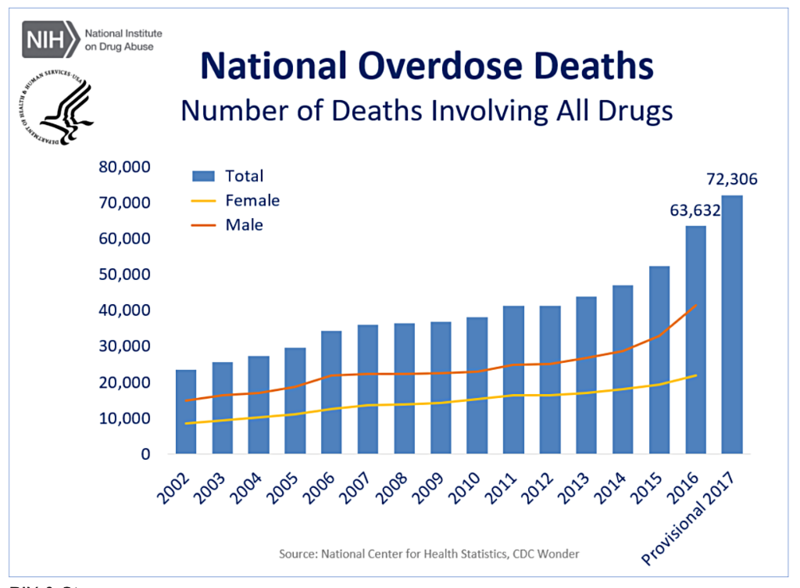 The US government does not track death rates for every drug, but the National Center for Health Statistics and the Centers for Disease Control and Prevention collect information on many commonly used drugs. CDC has a searchable database, Wonder, from which these numbers come. 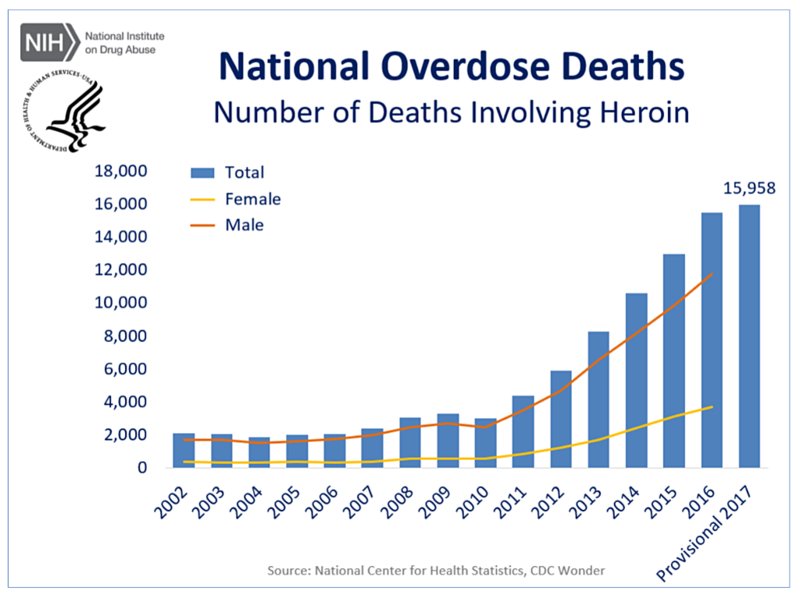 The National Institute on Drug Abuse has graphed them to help the public see what a serious problem our nation faces. We reproduce them here to help spread the word. 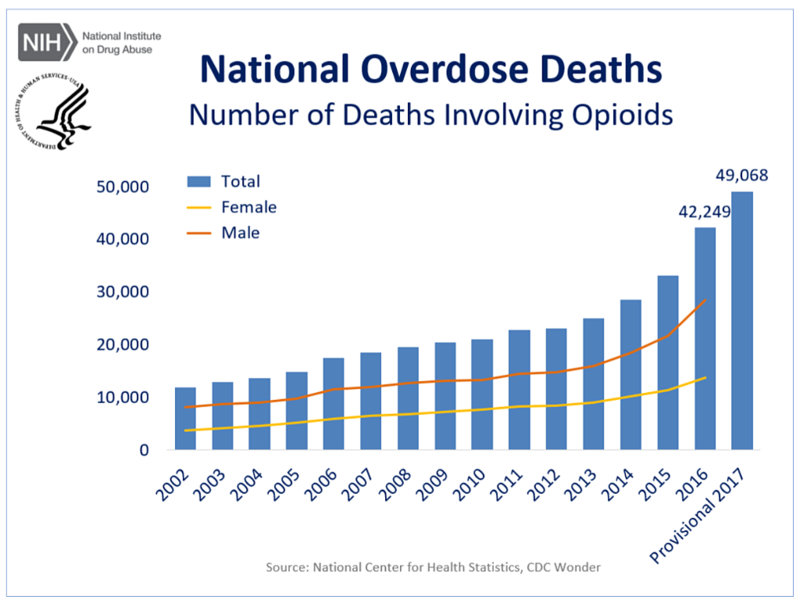 Not all of these deaths are due to opioids, as later graphs below will show. Each graph contains a yellow and orange line indicating female (yellow) and male (orange) deaths. The lines end in 2016 because 2017 data are provisional. They will be finalized later this year. Total drug-related deaths have increased 3.1-fold since 2002. Some 49,068 Americans died from opioid overdoses last year. These numbers include opioid painkillers, heroin, and illicit opioid synthetics, primarily fentanyl. Note: These charts are not mutually exclusive so they cannot be summed. Overdoses from synthetic opioids, primarily fentanyl, killed 29,406 Americans last year. These overdose deaths are up by one-third in just one year (from 2016 to 2027). 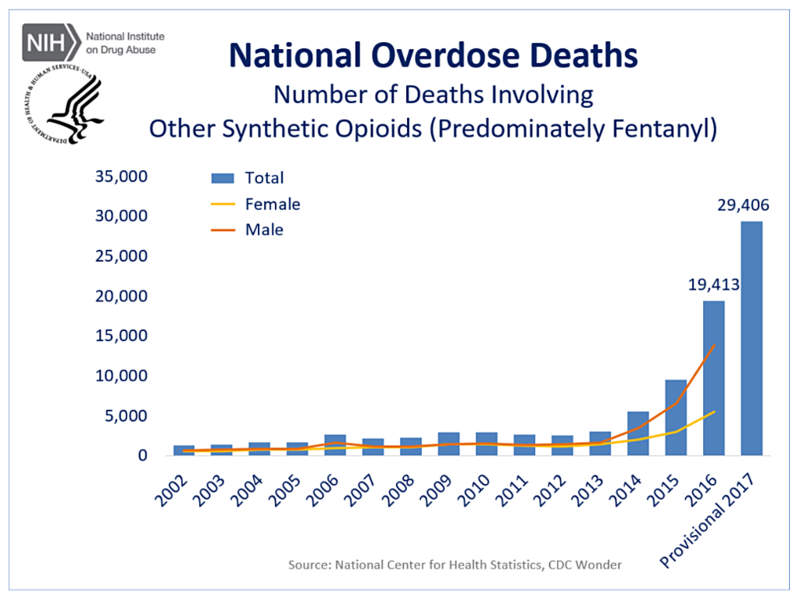 There has been a 22-fold increase in synthetic opioid deaths since 2002. This is a 7.6-fold increase since 2002. 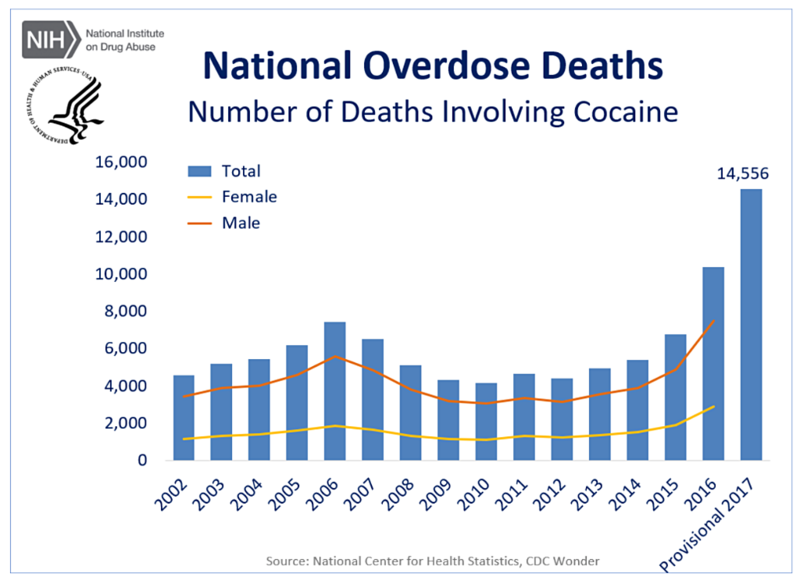 Since 2010, cocaine deaths have increased 3.5-fold. killed 10,684 Americans last year. 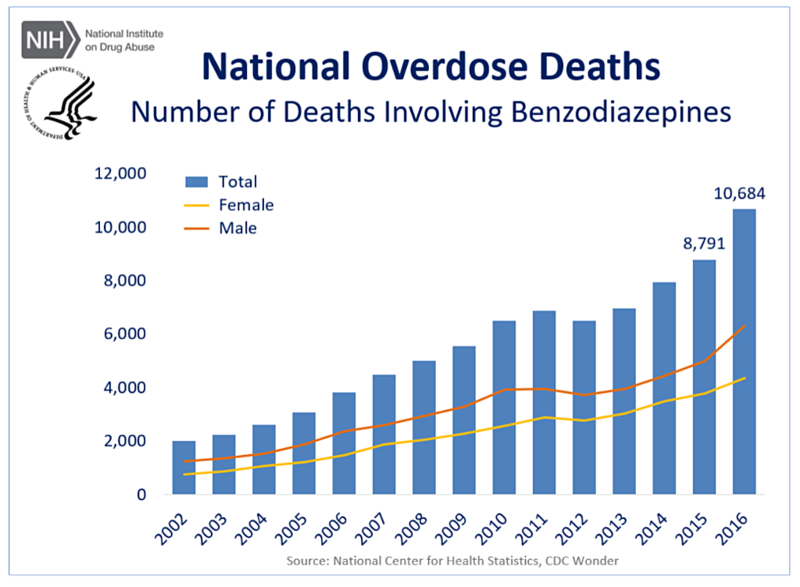 From 2002 to 2016 there was an 8-fold increase in benzodiazepine overdose deaths. more comprehensive drug testing in hospitals. 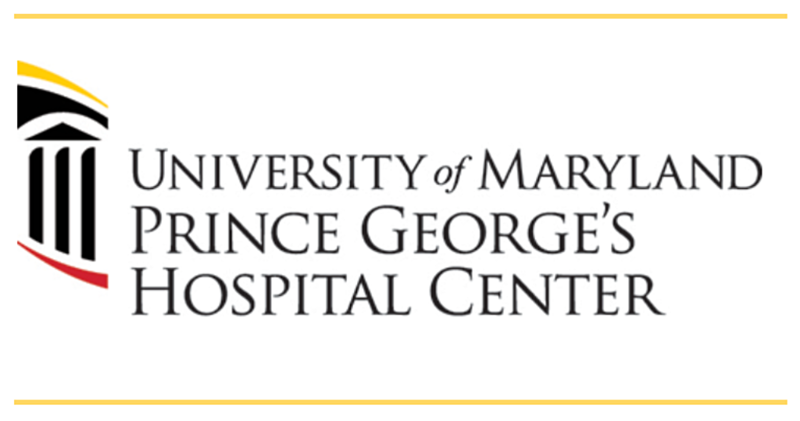 Researchers set out in 2016 to identify the kinds of illicit drugs causing overdoses in patients presenting at the University of Maryland Medical Center Midtown Campus in Baltimore and the University of Maryland Prince George’s Hospital Center in Cheverly, a suburb of Washington. The researchers, from the Center for Substance Abuse Research (CESAR), were generating reports about patterns of drug use in the criminal justice system and they decided to apply their technique to hospitals. At the time, emergency department physicians at the two hospitals were dealing with an increase in accidental overdoses and deaths they thought were caused by the synthetic marijuana product called K2 or Spice. Working with these doctors, the researchers analyzed de-identified urine specimens and linked them to de-identified patient medical records at the two hospitals. The urine specimens were tested for 26 synthetic cannabinoids, 59 designer drugs, and 84 other illicit and prescription drugs. About a year later, the lab expanded its tests for synthetic cannabinoids from 26 to 46 metabolites, but only a quarter of the samples tested positive for synthetic cannabinoids, much smaller than anticipated. Marijuana was the most common individual drug detected in the urine specimens. From a fifth to a third of specimens at each hospital also tested positive for a new substance other than synthetic cannabinoids. Two thirds of patients at both hospitals tested positive for multiple substances; some specimens contained as many as six different kinds. After marijuana, fentanyl was the drug most frequently present in Baltimore specimens while PCP was the second-most frequent substance in specimens in Cheverly. The researchers conclude that drug use is a much more complex problem than previously thought. Read Science Daily article here. Download full report here. cannabis use, as legalization forges ahead. Users or former users describe “lost jobs, lost marriages, lost houses, lost money, lost time. Foreclosures and divorces. Weight gain and mental-health problems,” writes the author of this article in The Atlantic. Perhaps the biggest problem for such users is having to convince others that the problems they are suffering result from their marijuana-use disorders. More women are using pot during pregnancy. Pregnant women with severe nausea and vomiting in their first trimester were nearly four times more likely to use marijuana than those without morning sickness. Those with milder symptoms were twice as likely to use the drug as those with no symptoms. More than 220,000 pregnant women in northern California completed surveys and submitted urine samples for drug screening in their first trimester. Researchers analyzed these data and also examined the participants’ medical records, looking for diagnoses of mild to severe morning sickness. Some 2.3 percent of the women had severe nausea and vomiting; another 15.3 percent had milder symptoms. The rest experienced none. Among those with severe symptoms, 11.3 percent used marijuana and among those with mild symptoms, 8.4 percent used the drug compared to 4.5 percent who used marijuana but had no symptoms. 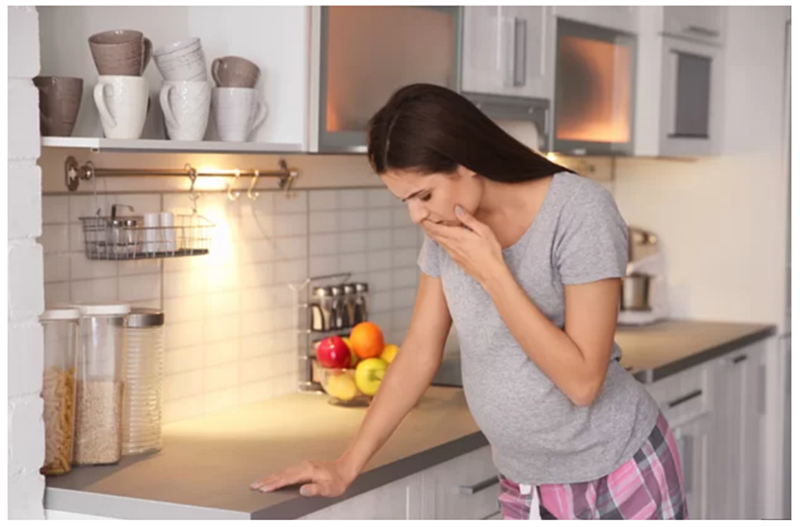 The researchers say they hope their study will encourage clinicians to provide safe and effective medicines to treat morning sickness. They also encourage clinicians to educate pregnant women about the negative effects that using marijuana during pregnancy may have on their babies, noting that the American College of Obstetricians and Gynecologists recommends that women use no marijuana during pregnancy and lactation. Read Live Science article here. Read JAMA Internal Medicine abstract here. The Marijuana Report is a weekly e-newsletter published by National Families in Action in partnership with SAM (Smart Approaches to Marijuana). Visit National Families in Action’s website, The Marijuana Report.Org, to learn more about the marijuana story unfolding across the nation. Subscribe to The Marijuana Report. by shining light on the science that underlies their effects. Addictive drugs harm children, families, and communities. increase use, and expand harms. Science shows that addiction begins in childhood. It is a pediatric disease that is preventable. addictive drug industries that will target children. We support FDA approved medicines. for users and low-level dealers as alternatives to incarceration. To reduce the unintended consequences of current marijuana policies, such as lifelong stigma due to arrest. To prevent the establishment of “Big Marijuana” – and a 21st-Century tobacco industry that would market marijuana to children.